Here's a question, and lord knows, there may not be an answer. Have you seen any rings online that would do super-duty as engagement rings, that any girl would be out of her mind to not love, that are under $100? We're poor/in love out of our minds, and want to get engaged asap. I showed the Love of my Life the catbird heart ring for $88 and he said he loved it, but in all due respect, he couldn't ask for my hand with it. i love the catbird heart ring! tell him to get over it! and if that doesn't work- get a classically beautiful thin plain gold band. duh. or get this and then buy yourselves dinner. What? I heart the heart ring! If you both love it, why not just go with your gut? 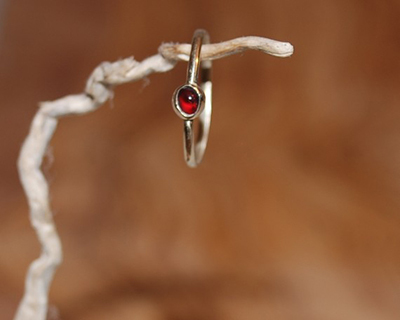 The Rich Ruby Red ring is amazing. I've never wanted an engagement ring and I want that one. This one from Kate Szabone is $135, but really, really sweet. And perhaps a bit more traditional/engagement-ring-looking to please the fiance. But I decided there is no real need for an engagement ring (which is what I told my boy) ...save your $$ for the wedding ring! I don't want to be old-fashioned here (maybe I am), but most fellas kind of like to figure this out on their own. I'm not sure pointing him in the direction of any one ring (unless he has outright asked) is the right thing to do. I think he probably loves you very much and is, as we speak, planning a way to sweep you off your feet (and ask for your hand) in his own way. Don't stress about the ring! i've been hanging out next to the microwave, tryin' to grow extra fingers so i can wear all of the rings at made her think. if you're willing to cheat and spend $207, oh my god this one. if not, this one's awfully fun. My fh had my ring custom made with a herkimer from our friend's property, and I couldn't love it more! It was super cheap, totally unique, and has a story. Although, Ali's forget-me-knot rings are seriously cute. the markhed and erica weiner are my favorite. they're just so damn lovely. Love the Hermiker Solitaire! 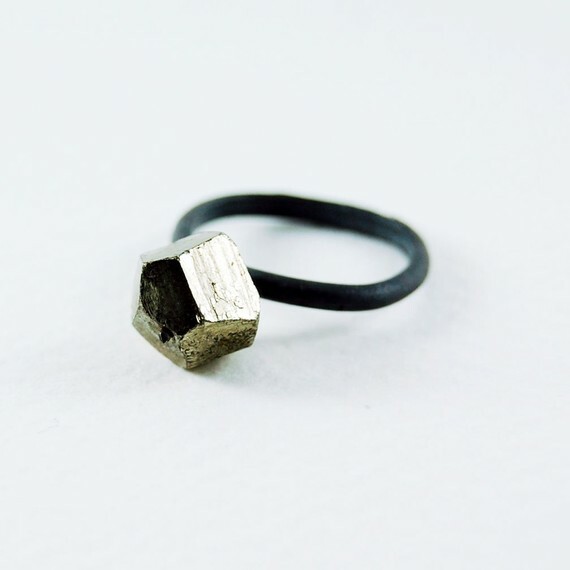 It looks like a typical engagement ring, only much more edgy. I can relate to being broke and in love! We didn't have money for a proper ring. We happily accepted my grandmother's solitaire diamond and six teeny tiny stones (four rubies, two diamonds) as well as scrap gold from my then-fiance's mother and grandmother. 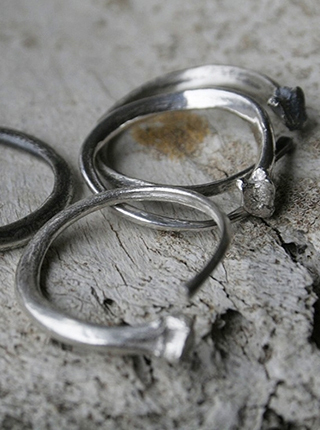 We used these borrowed treasures to have my ring custom-made. I love it; it has so much sentimental value to me. I'm a big fan of Ruby Lane for vintage and antique affordable jewelry. Also, most sellers on RL accept layaway and/ or are willing to negotiate, so you could even work it out that way. 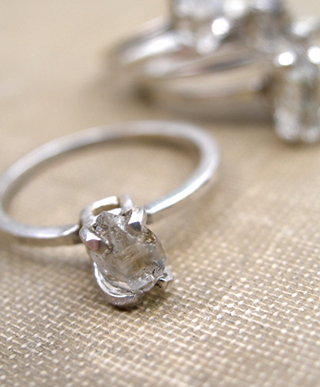 I think either of these Blanca Monros Gomez rings would be sooooo beautiful as an engagement ring. You would only have to cheat a tiny bit over your budget! also check out onegarnetgirl on Etsy - lots of options for under $100. my beau, now husband, found her (on his own!) and not a day passes that i don't stare at my engagement ring and wedding band. the wedding band we had custom made by onegarnetgirl, fairly priced with responsibly sourced diamonds and without breaking the bank. i'm a bario neal chick. 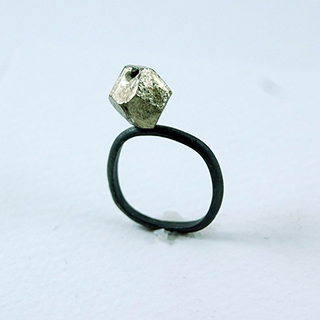 http://bario-neal.com/bn/collections/boutique-jewelry/alluvial-collection/knottedrush-ring.html bam. Jesus F, I love the internet. Thanks, lady loves! Thanks for the ideas! BF X is totally into us talking about rings together. When it came up months ago that money is an issue, I said, "My love, there are thousands of options! Let us find them!" I send him ideas, he gives me feedback, and then he gets all secretive about his decisions. OMG @ali, LOVE the kiel mead forget me knot ring! @J, I totally have to second a vintage ring. And while I LOVE this one also at Ruby Lane: http://www.rubylane.com/item/669694-4361/Darling-Tiny-10k-Yellow-Gold, I have to say that every time Im at an antique store, there's always several dealers of vintage jewelry that have bands for really inexpensive. If you are into vintage, go to antique stores, find a dealer you like and get their business card. Chances are they have a ton more that arent being shown AND theyre more willing to make a deal with you than an artisan or established jewelry shop. I'd recommend Polina@Jewela for inexpensive but still beautiful handmade wedding and engagement rings/bands. She made my fiances wedding band for us, and we couldn't be happier.